I have been searching for the right baby picture, one that I can relate to very much, but to me they are other people’s baby. And then, I was thinking to myself maybe an angel, a little baby angel but still I didn’t feel very much. I came across some bunnies picture and I feel a lot towards them. I feel I can find much comfort in them and decided I wanted one on me. I begin searching and I found this current one, her eyes are beautiful and I know she is mine. Pain anot? OF COURSE lah! The entire procedure was eased with a recollection of the whole entire pregnancy; the 1st day we went K.K, the 1st time we heard the good news, all the ups and downs, to how I was spotting, to cramping, and the painful memories of how we lost our lil one. A roller-coaster ride full of emotions. 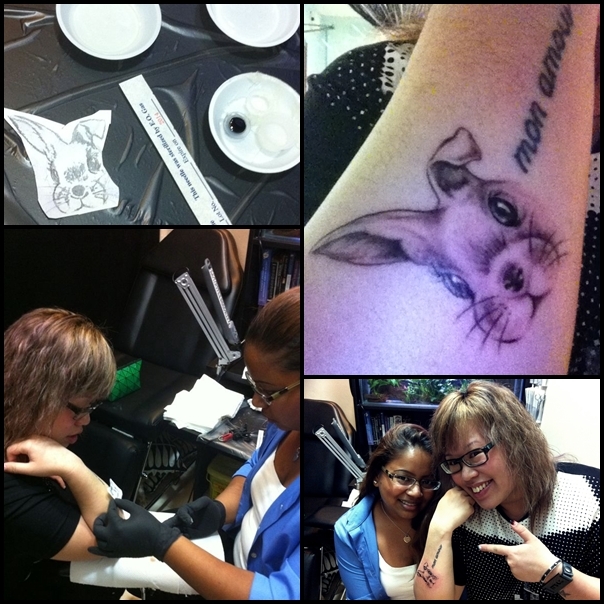 Su is an amazing tattoo artist and she made our bunny came alive. I LOVE LOVE LOVE LOVE this sooooooo much! Babe, thankssssss so much for everything and yes, I’ll see ya soon. Everything feels more complete now.